Once your tiny tot starts to walk or crawl, she will end up exploring each corner of your house and every inch of the local park she is taken to. This is when insect bites are bound to happen. 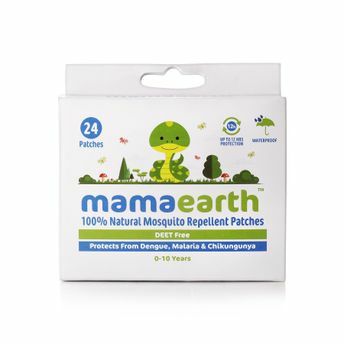 Now you can ensure that your baby has a fun and enjoyable playtime with Mamaearth's Natural Repellent Mosquito Patches for babies with 12 Hrs Protection.The 100% natural blend of Citronella, Eucalyptus, Peppermint Oil & Lemon extract protects your loved ones from Dengue, Malaria & Chikungunya. It can be pasted on your child’s clothes, cot, pram and schoolbag.The Natural Repellent Mosquito Patches are waterproof and can be used for both indoor and outdoor activities.Also, tese do not leave any residue on clothes after removal. Perfect for both Indoors and Outdoors.They can be pasted anywhere on clothes, prams, cots, school bags etc. The patches provide protection from Malaria, Dengue and Chikungunya spreading mosquitoes for up to 12 hours. The Waterproof patches are ideal for any outdoor activities like sports, camping, school, park etc. Safe for the entire family including babies and toddlers as they are non toxic without any pesticides & DEET free with no side effects like eyes irritation or skin damage. Each pouch contains 12 sheets of 2 patches in a ziplock packaging to ensure we preserve the efficacy of our patches. Additional Information: Asia’s 1st MadeSafe Certified Brand! Mamaearth aspires to take care of every parents & baby's wellbeing from head to toe with safe, toxin free, international standard products which you can choose without having to think twice.The products under the brand go through multiple testing processes including clinical dermatology testing in Europe to make sure they are high quality, global standard products. Apart from being safe as certified these products are also enriched with goodness of natural ingredients like Calendula Extract, Shea butter, Jojoba Oil to name a few. Mamaearth plans to provide safe natural solution to problems ranging from morning sickness to baby colic in future. Explore the entire range of Mosquito Repellent available on Nykaa. Shop more Mamaearth products here.You can browse through the complete world of Mamaearth Mosquito Repellent .